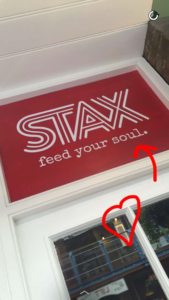 Foodie Fieldtrip Friday: Does Stax Stack Up? I’ve been wanting to check out Bea Vo’s restaurant Stax in Carnaby, London since I first heard about it from Miriam over at Bake My Style. She raved about the chicken and waffles. 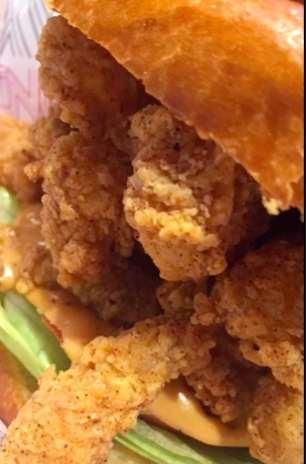 I consider myself somewhat of connoisseur of chicken and waffles since the place for the best in the world was at my doorstep in Los Angeles where I lived for many years. I’ve spent numerous wonderful times at Roscoe’s House of Chicken and Waffles. So naturally every other version would likely be judged against that. A bit unfair maybe, but true. Though I was a bit lost getting there I didn’t mind as I love to explore London. 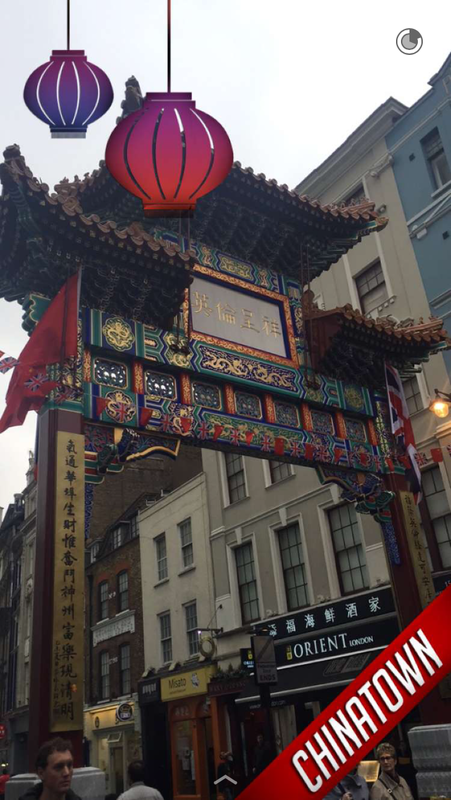 Winding my way through Chinatown and Soho before I found the place, it was a very busy Friday night. It seemed all the pubs and restaurants were bursting at the seams with customers. 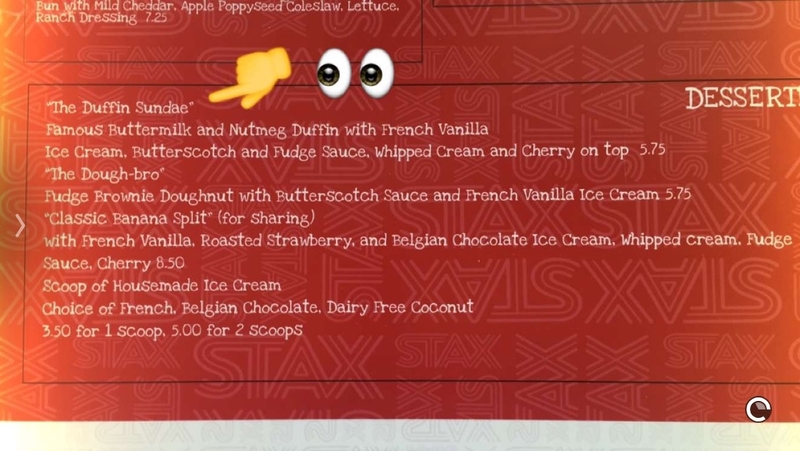 When I arrived at Stax I was told it could be a 90 minute wait. They have a system where they take your mobile number and text you when your table is ready. You can even click a link to see where in the queue you are. I didn’t think Hubby would go for this situation waiting so long to get in to eat food. But he knows how important these Foodie Fieldtrip Fridays are to me. 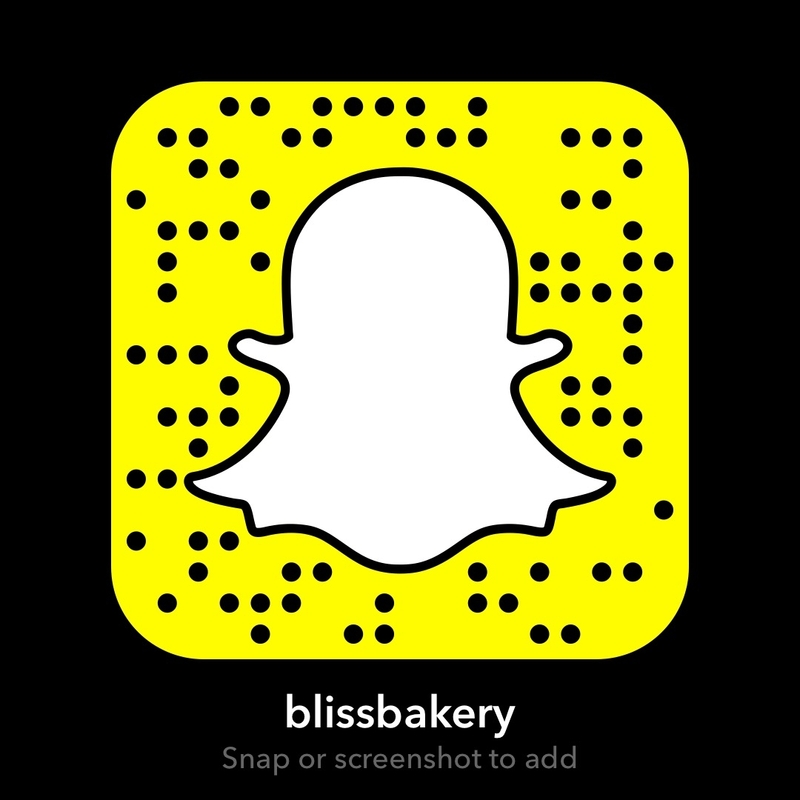 I bring along my Snapchat friends (my username is blissbakery) and share the experience with them too. Luckily for us we only waited one hour. As the restaurant is very small and cramped, we had to stand outside. Though the calendar says June, it was quite chilly. But once we sat down our food didn’t take long to arrive. Though it was hard to talk as the music was extremely loud. And funny enough it was all pulsating beats. You know that dance, techno rave style? 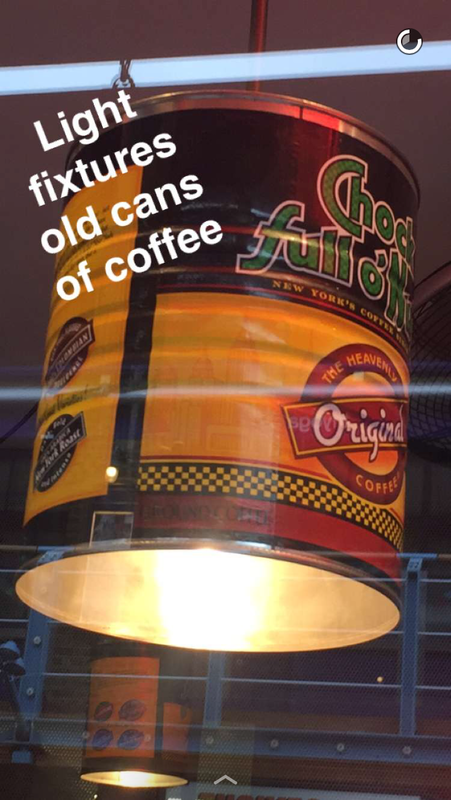 Which was interesting as it didn’t quite match the diner-esq decor. The bathroom is papered with vintage concert adverts for Rock, Country, and Rhythm and Blues acts such as Muddy Waters and Johnny Cash. In fact the music vintage details are so cool that there is even a proper drum set dangling from the ceiling. Yet the music we heard was all electronic drums at best, ne’er a cymbal or snare sound in reach. I had taken a previous Foodie Fieldtrip Friday to Bea Vo’s Bea’s of Bloomsbury for a wonderful tea time outing. So I was eager to experience one of her other culinary babies. This one is an ode to her Southern roots. With food inspiration based on her upbringing in the American South, the menu is reflective of that. 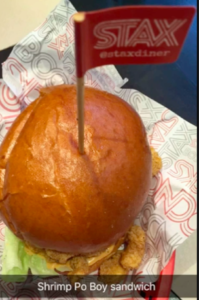 With offerings such as fried green tomatoes, a variety of hamburger options, and Po Boy sandwiches stuffed with breaded shrimp. My hubby ordered the Po Boy and it was awesome! He even let me have one bite before the rest was inhaled! Of course I ordered the chicken and waffles. We opted not to go for the cocktails but the selection is nice. Hubby just got a Sprite and I asked for a coffee. They apologized, but said they don’t have it on the menu. 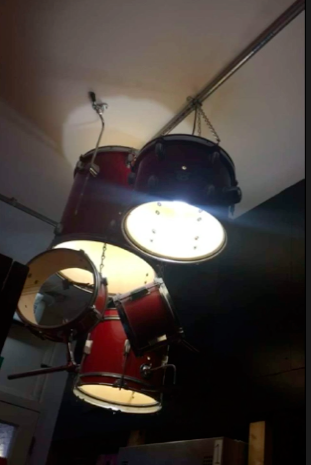 I thought that was a little strange since the lighting fixtures are made from old coffee cans. I am a massive fan of DESSERTS! And the menu choices here are not for the faint of heart. They are not just ordinary sugary treats, but decadent, delicious and also daring. Bea created the Duffin (a donut/muffin amalgam) and she serves it with ice-cream and a butterscotch fudge sauce! OMG! But I was pretty full from our main course and at this stage it was quite late, so we decided to head home. 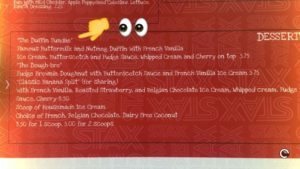 But I do want to go back to try some of these sweet treats. 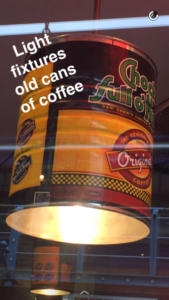 But I guess I’ll have to sneak in my own coffee to go with it! 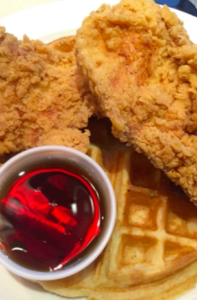 And so the question is, how did Stax chicken and waffles stack up to Roscoe’s? Since I don’t like to say anything negative I won’t go into too much detail. But suffice it to say, I can hardly wait to get back to Roscoe’s in L.A. as there is a reason the likes of President Obama and practically every celebrity in the world pays that place a visit. Yet, I don’t think there is anything else like Stax in London. And considering the line to get it, everyone seems to be happy with it. I just think I need to give it a try again (at an off peak time) and order something else. But check out these two Instagram videos of Roscoe’s and Stax and decide for yourself.